Simon Terry, the top UK recurve archer in 2007 and multiple UK record holder including 1351 at Timperley this year, became an LAA archer in October when he joined Chorley Bowmen. Welcome Sir! Dave Hunter, Recurve, Rochdale Company of Archers. Dave affiliated through RCA in October and is now an LAA archer. Welcome Sir! May:Lancashire vs. Warwickshire vs. Cheshire. Lancashire second in both recurve and compound. Warwickshire win both. October: Five Counties Match. Lancashire second in the recurve (beating Yorkshire by 2 points!) Third in the compound. 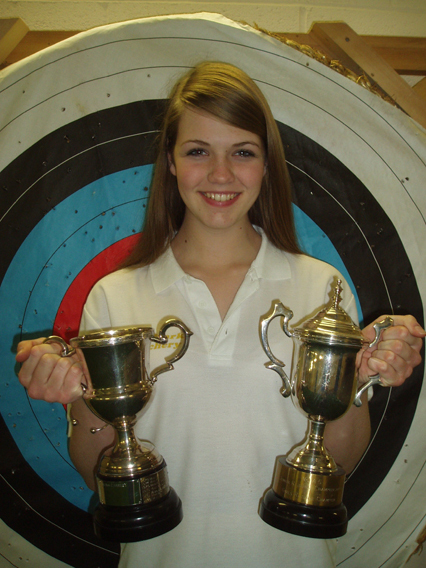 Winner of the NCAS Under 16 and overall Junior Girl Recurve title at Wakefield scoring a magnificent 565 on a Portsmouth round which beat the Senior Lady Champion by 15 points! When not shooting Connie manages to find time to play the bass guitar and sing in a rock band called Static Revolver as well as studying for her GCSEs.